ITIL Foundation Exam Study Guide by Liz Gallacher and Helen Morris definitely helps me to understand the topics in ITIL as well as form a mental picture of the ITIL Service Management Lifecycle. As I read the text, I make my own ITIL Foundation Exam study notes which is to be used just before my ITIL exam as a last minute revision notes. In total, I spent about two weeks reading the ITIL Foundation study guide and making my notes (about 2 hours each day) and I got 95% correct in the ITIL exam paper. This article introduces the ITIL® Foundation Certification Exam Prep Book that I used to pass the ITIL® Foundation Exam. Highly recommended for ITIL® Foundation Certification aspirants. I got a score of 95% (38/40) in my ITIL® Foundation Exam. If you ever want to pass the ITIL® (Information Technology Infrastructure Library) Foundation exam, this is the book I would recommend you. The content of this guide is updated for the most current version (the ITIL® v4 Foundation syllabus) and was written by two of the most accomplished trainers in ITIL® Foundation and Intermediate training (you may read more about the backgrounds of the authors in the “About the Authors” section below). 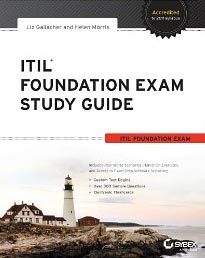 This ITIL® study guide tries to re-organize the ITIL® Foundation Exam Syllabus in an structured way to help self-study readers to reach ITIL® Foundation Certification success. The ITIL® Foundation Exam Syllabus itself just describes the knowledge and terms required for the students to learn and understand in order to pass the exam, however, . This ITIL® book fills the gap by providing the linkage between the discrete pieces of knowledge to a cohesive one. Chapters are arranged according to the ITIL® Service Lifecycles (Service Strategy, Service Design, Service Transition, Service Operation, Continual Service Improvement) with additional ITIL® processes, roles, functions and definitions introduced when appropriate. Note: if you haven’t book your ITIL® Foundation Exam, you may take a look at this ITIL® Foundation Certification online course + Exam fee bundle that includes the course, mock exams, download e-book as well as the ITIL® Foundation Exam voucher in a package. ITIL® Foundation Exam Study Guide by Liz Gallacher and Helen Morris definitely helps me to understand the topics in ITIL® as well as form a mental picture of the ITIL® Service Management Lifecycle. As I read the text, I make my own ITIL® Foundation Exam study notes which is to be used just before my ITIL® exam as a last minute revision notes. In total, I spent about two weeks reading the ITIL® Foundation study guide and making my notes (about 2 hours each day). Both authors, Liz Gallacher and Helen Morris, have extensive experience in successfully implementing ITIL® in a wide variety of organizations and teaching ITIL® in various levels, including the Foundation level. They have helped organizations large and small implemented the best practices in IT service management to reap remarkable service improvements. They both have the ITIL® Manager and ITIL® Expert certifications and are fully accredited as ITIL® trainers. Liz Gallacher has a profound knowledge in ITIL® and was in the top 5 percent of candidates in the ITIL® Manager certificate. She is a global ITIL® trainer delivering ITIL® Foundation as well as Intermediate courses in India, China, Australia, New Zealand, Germany, the United Kingdom, etc. Helen Morris has over 20 years of experience in service management consultation as well as ITIL® training. She holds ITIL® Foundation and Intermediate courses in the United Kingdom, Europe and the United States. You can take a look and read dozens of pages of the ITIL® Foundation Exam Study Guide by Liz Gallacher and Helen Morris by clicking the link below. You will be redirected to Amazon where you can flip through the book just as you are holding it in a bookstore. I can re-take the ITIL Foundations exam as many times as it takes me to pass with no additional charge? Sorry no. Would need to pay for every re-exam. But the exam is indeed quite easy. Wish you ITIL success! You can actually depend on the reference book only to be well prepared for the exam. I know many aspirants need not take any courses for the ITIL Foundation Exam (but not for higher ITIL levels). I bought the Greycampus ITIL Foundation course so wanted to know if the downloadable pdf course material is enough to be prepared for the ITIL foundation exam? I am not really good at learning through powerpoint videos so I do better with it printed out. Is that printed material and the mock exams enough? Should I also spend time studying this study guide by Liz Gallacher in addition to the course? Also what should I aim to score on the mock exams? How many mock exams are enough? Yes, you can print out the downloadable course materials to study for the ITIL Foundation Exam. I would say that studying this material alone will probably gain you a pass in the exam. If you would like to play safe, you are recommended to also take a look at my study notes on this website and/or the recommended ITIL study guide. I would advise getting at least 80% in the mock exam in first try. Do try as many exams as needed until you have reached this score range and you are ready to pass the exam. I am planning to take ITIL V3 Foundation 2011 certification. Kindly can you please advise from where I can check examination schedule and to register? I wanna get ITIL foundation exam this year, can you help me about exam prep guide or do you have your own created stuff. Where should i go to find exam fee and registration stuff like that. I want to create a career path in project management and also write the ITIL V3 foundation exam. I live in the USA, i will like to know if i should go for PMP or Prince2 exam to be able to have a great career in project management. More so, i want a career that will go along with my current job as an electronic medical record officer. I want to do self studying for the ITIL and either of PMP or prince2, wiill i be able to register for the exam by self studying and what are the requirements for PMP certification, i know Prince2 doesnt require a university degree but i am not sure of PMP. i will appreciate your quick response. I planning to get certified on ITIL Foundation. 1) Is ITIL Foundation & ITIL V3 Foundation different?. (If different , to which I should opt for as I am a beginner). 2) Can you provide me PDF’s for preparing examination. 1) They are the same currently. The “V3” indicates that the ITIL is in the third version which is the latest. For your info, the current version is in fact ITIL V3 Foundation 2011 as minor changes were introduced in the year of 2011. So do look out for study materials for the 2011 edition. 2) You can download my study notes as PDF files from this website. Hope you will find my ITIL study notes useful. Please Mr Edwin Chung, can one use your study notes to prepare for the exams without reading an accredited ITIL V3 Foundation book ? Thanks for this blog, im very happy todiscover it. I am afraid my study notes alone won’t be enough if you haven’t taken any courses / read any book on ITIL Foundation Exam. You are encouraged to at least read another ITIL Foundation reference book. I bought an online course for self study training, do you think I need to buy this book too or the online course should be enough? Just my two cents: I thought the ITIL Foundation Exam is not too difficult, if you have already done the online training, that would be quite sufficient indeed. But I always played safe, so I also brought the ITIL Foundation Study Guide to reinforce my study to be 100% certain of passing the exam in first try. If you are not too tight on budget, I highly recommend you to purchase this study guide too. Hello Edward, I wanted to buy your book to prepare for the ITIL Foundation exam but this morning I realized that there is a new syllabus in 2014 … do I recommend the same to buy your book for preparmi although it is based on the syllabus in 2011? I await your kind advice. Thanks for your comment. I have done a research about the new syllabus but found that ITIL Foundation exam is still based on the ITIL v3 (2011) version. In short, the recommended ITIL Foundation textbook is still applicable to the current ITIL Foundation Exam. Wish you ITIL success! Say I buy an ITIL Foundation training book off Amazon, how do I register for the exam? Also, being in Canada, I’ll order from Amazon.ca, can you provide me with a link to a book on the Canadian site of Amazon so that you may receive some sort of compensation ? See website hyperlink for an example for a book I’m looking at at the moment. If you have a better idea for a book, please feel free to suggest one! Thank you for your help and posting your valuable knowledge! You may register for the ITIL Foundation exam online through PeopleCert directly if you did not purchase an ITIL exam prep course which includes the exam voucher (e.g. http://edward-designer.com/web/affordable-itil-foundation-online-course-with-official-exam/). Sorry that I don’t have an affiliate account on amazon.ca currently. But really thanks for your thoughtfulness! in your opinion, in order to pass the ITIL v3 Foundation exam, is it enough to read only the exam study guide book and do not take any (paid) e-learning courses? That really depends on whether you are a “self-study” guy. I did take a course which I though was useless. I depended on this guide to pass the ITIL v3 Foundation exam. This guide should cover everything needed for the exam. I plan on taking the ITIL Foundation Self Study course as suggested.. Are you recommending that this book be purchased to compliment the course? Or is this book not needed since I am talking the self study course? As a after-thought, the ITIL book is indeed not necessary as the course would cover all that you need to know about the ITIL Foundation Exam (as the exam is quite easy indeed). At the time of preparation, I just wanted to play it safe by “over-studying” for the exam. Is there a difference between ITIL v3 Foundation and ITIL Foundation? I have an ITIL v3 Foundation study guide but thought it is outdated as I don’t see v3 on many ITIL sites anymore. Have they changed the content? Is the v3 Foundation material the same as ITIL Foundation? Your site is great! Full of great information. I appreciate your help. The v3 in ITIL v3 Foundation denotes that the ITIL is in the 3rd edition which is the second latest. The latest edition is “ITIL v3 Foundation 2011” which is an updated version from ITIL v3 Foundation. So if you are aiming to take the ITIL Foundation Exam now, you will need to base your studies on “ITIL v3 Foundation 2011” materials as there are many changes in the structure and terminology from the previous editions. ITIL v3 was launched in 2007 and revised in 2011 ( minor changes I guess) after this it is just called ITIL or ITIL 2011. There is a further revision in 2013. Also now it is managed by AXELOS, as the UK government contracts the maintenance of the ITIL framework to third party companies. For all those seeking to answer the exam, I suggest the book recommended here, just this is enough, if you prefer videos, ITProTV is very good. But for answering the exams, you will need the book as it depends on definitions which are not covered in the videos. Exam is pretty easy, but understanding ITIL is so critical for workplace success. I prepared for the ITIL exam based on your notes and your book suggestion. I studied approximately for 1 month after/before work and on weekends. I achieved 95% and would like to thank you for your really useful site. Now I´m just looking for a book to start my preparation. thanks for your advice Edward. This is a good book. I relied mostly on this book for my preparation. Wish you good luck for your ITIL v3 Foundation Exam! Thank you very much for the effort and dedication in sharing knowledge and study guidance. I just finished CBT Nuggets ITIL training, and now I’m gonna review the content through reading, and definitely your blog will be very helpful. Nice to read your article about ITIL. I would like to do self-study. Thanks.